Who hasn't enjoyed a Molten Lava Cake at a restaurant? It is hard to resist this warm cake with chocolate oozing from the center. Wanting to recreate this yummy dessert at home, I tried a version that involved baking the cakes, cutting out part of the cake, and then filling the cake with chocolate sauce. Although these cakes were very good, it was a lot of work to cut and fill the cakes. When I saw Kraft's Molten Chocolate Cakes recipe, it piqued my interest. With this recipe, you don't fill the cakes--these cakes form their own filling as they bake. I found this recipe so easy to make, but the results are really impressive. You can serve this with whipped cream or Cool Whip, but there is nothing better than cold ice cream on warm cake. Or, serve it with chocolate sauce and berries. Next time we are eating out and temped by expensive desserts, I will remind my family that we can make Molten Lava Cakes ourselves right in our own kitchen. A warm chocolate cake with liquid chocolate oozing from the center. 1. Heat oven to 425°F and butter four small custard cups and place them on a baking sheet.2. Microwave the chocolate and butter in a large microwaveable bowl on high for 1 minute or until butter is melted and the chocolate has begun to soften.3. Whisk the butter and chocolate until the chocolate is completely melted.4. Stir in the sugar and then add the whole eggs, the egg yolks, and the flour, and mix well.5. Spoon into prepared cups and bake for 13 - 14 minutes or until the sides are firm.6. Let stand for 1 minute, then carefully ran a small spatula or knife around the edges of the cakes to loosen.7. Carefully invert the cakes onto dessert plates and serve as desired with whipped cream, cool whip, berries, or chocolate sauce. I can not resist to a Molten Lava Cake...I found it so deliciuos...!!! LOVE molten lava cake! I never realized it had so little ingredients! This is one of my husband's favorite desserts! They look incredible. Oh Jill, these cakes would certainly satisfy any serious chocolate craving, and I'll have to remember them the next time I have to have a rich chocolate dessert! The photos are beautiful and tempting also! thanks for this recipe, I have never made these cakes at home-but have eaten in a restaurant. Nice that the recipe is not a difficult one. Yum! Your photography is lovely, the dessert is beautiful! Beautiful photos of this treat. I love the fact this is an easy version. I love molten chocolate cakes and these look so simple! Bookmarking this one for later! What a treat! I'm sure the homemade version is much nicer than the restaurant cake! Yes, this has to be one of the best restaurant desserts! And I had no idea it had so few ingredients. This sounds and looks heavenly! This looks delicious, I have never tried one or made one. Maybe time for a change. looks absolutely perfect. I've only made molten lava cakes once... but there is something so wonderful about a gooey warm chocolate center. I love molten lava cakes and make them often. However, I have to say this one looks stunning and your strawberry really pops out. Don't you just love it when something that looks so complex is really quite simple to make and delicious? Thank you for sharing. I never realized that there are only a few ingredients to these gorgeous molten Lava cakes. Oh Boy... I love getting these. I have been anti restaurant lately due to the cost. Love the idea of doing restaurant recipes at home. I have tried so many different recipes for molten lava cake but none of them seem to be perfect. Your picture says otherwise--I'll definitely be trying this. Your photos and cakes are beautiful. I am loving your blog. Thanks for stopping by. Oh dear, that sounds so delicious. I could really do with something rich and chocolatey right now. Your picture looks like it came straight out of a cookbook! This is AWESOME! I love lava cake but have never made it! Thank you SO much! Beautiful photos, too! What a pretty and rich chocolate treat! I have to admit that I've never eaten Molten Lava Cakes. But I have always wanted to try making them at home. Yours turned out perfectly and so pretty. Will have to give them a try finally, maybe this weekend. Love all that gooey chocolate pooling on the plate, double YUM! 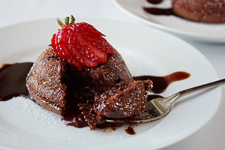 Your molten lava cakes look so perfect! I can't wait to make one of these at home but with less sugar. I made these last week and even though it was overcooked (no lave in the center) it was rich, super moist and delicious! Definitely an easy and amazing desert! Just about to make another batch and I will cook it in less time to get that yummy lava! I make them in a muffin pan, then store the rest of the cake in a tupperware which keeps for days on the counter. Heat it up for 30 seconds in a microwave and top it with some chocolate sauce and mint chocolate chip ice cream.. divine! Only need a small portion since it's so rich. 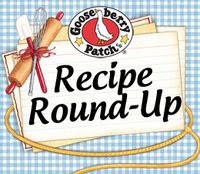 Thanks for sharing the recipe, we will be having these after dinners!